The view and what Mick Rodgers (Tinkoff Saxo) must be feeling are the same, he is on top of the world. To win a stage in a Grand Tour is something that an extremely limited number of people can ever claim to have done, to win two in the same race is exponentially rarer. After today, it is something Rodgers can savor for years and years to come. 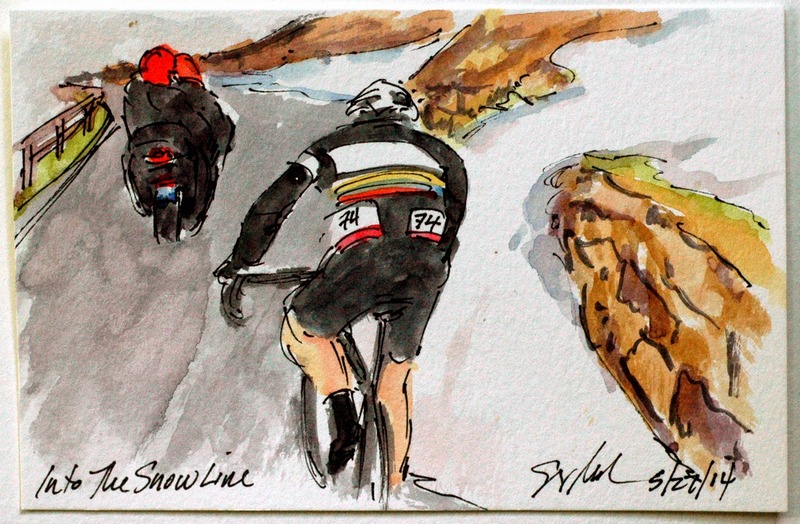 And then he can add to it that it was on one of the hardest climbs in any Grand Tour and against the arguably best climber of the contemporary peloton. Chapeau, Mick! This is an original watercolor and ink postcard that is available for purchase through my artist website at www.greigleach.com. For this particular painting just follow the direct link at the end of this post. 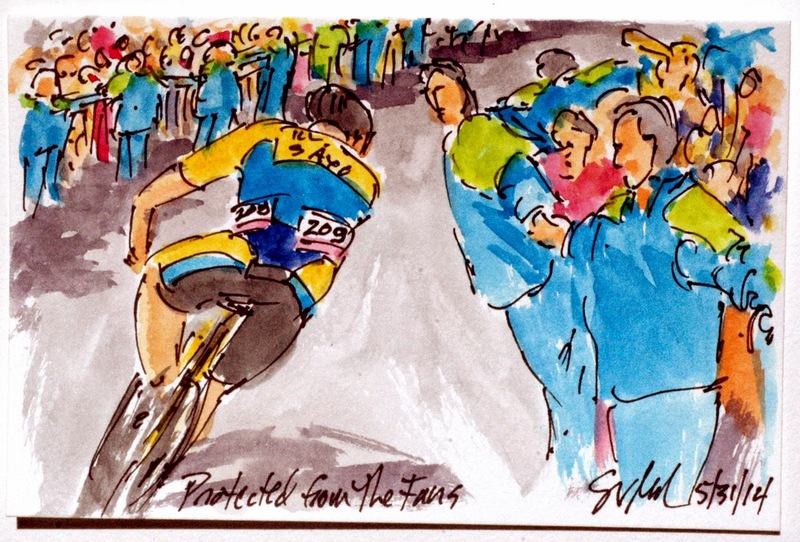 Once Mick Rodgers (Tinkoff Saxo) was within the final kilometers, the entire route was lined with security personnel who had linked arms to prevent exactly what had happen just two kilometers earlier. Rodgers was climbing wheel for wheel with Francesco Manuel Bongiorno (Bardiani CSF). Just as Rodgers stood up to escape the Italy and over zealous fan, hoping to help Bongiorno, pushed the Bardiani rider so hard that he had to stop and put his foot down so as not to run into the Australian. This disrupted Francesco's rhythm and broke his spirit as well. He was unable to catch back up to Rodgers, who never waited. It seems unlikely that the incident with the fan changed the outcome of the stage, but it is a lesson to all of us should we get the chance to see these races in person. Let them race and cheer them on from a safe distance! Maybe watch the alcohol intake as well. This is an original watercolor and ink postcard that is available for purchase through my artist website at www.greigleach.com. For this particular painting you can follow the direct link at the end of this post. Both Nairo Quintana (Movistar) and Rigobeto Uran (OPQS) can be saying, "Job well done" to their teammates after today. First for Quintana, his team worked tirelessly to drive the pace of the peloton and to chase down any of the attacks from the top five riders on General Classification. And Uran will thank Pieter Serry (OPQS) who put in one last push as he was drifting back from the break to pull Uran further away from Fabio Aru (Astana) who is just behind Uran on the GC. Still hanging tough after throwing something from a fan into the woods, is Serge Pauwels (OPQS) pulling Uran up the incredibly steep Monte Zoncolan. Perhaps Uran was hoping to gain time on his fellow Colombian who is clad in pink, but he couldn't have realistically thought he would make up three minutes on his compatriot. This is an original watercolor and ink postcard that is available for purchase through my artist website at www.greigleach.com. For this particular painting just follow the direct link at the end of this post. 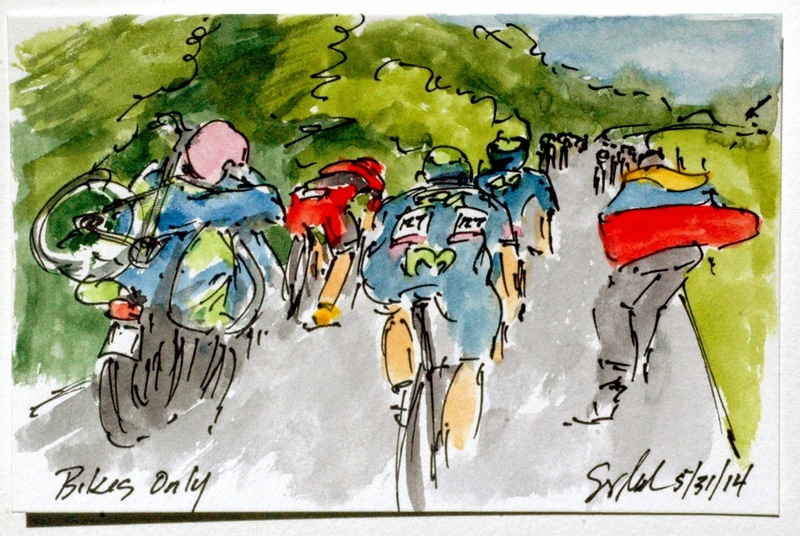 Like certain sections of Pave in Paris-Roubaix, the final climb of the Giro d'Italia was restricted to cars and trucks, it was bikes only on the steep narrow way up Monte Zoncolan. I have never seen what the mechanics had to do to meet this restriction. They actually pulled a couple of wheels and a spare bike off of the team car, along with their tools, and climbed onto the back of a motorcycle so they could be there for their athletes. The dedication to the effort of the Giro goes well beyond the guys pushing the pedals. This is a group slipping off the back of the Gruppa Magila Rosa including, Gorka Izaguirre (Movistar) and sadly, Cadel Evans (BMC). 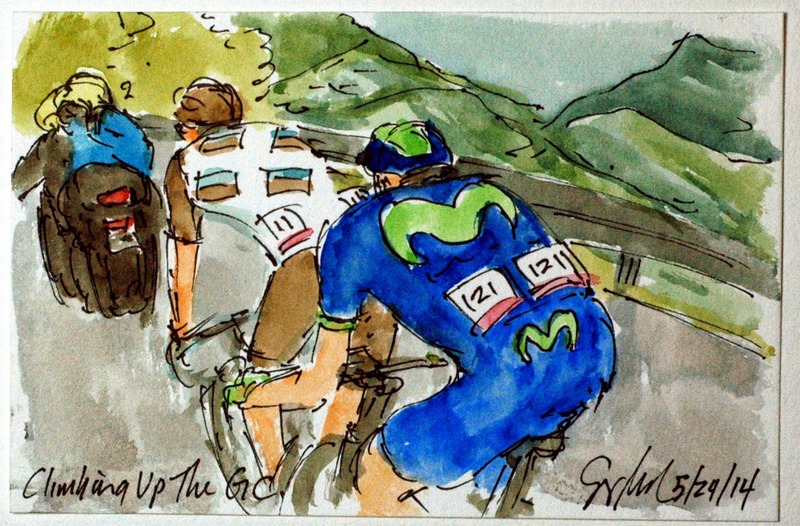 The Movistar riders had done what they could for their man in Pink, Nairo Quintana. Cadel drifted off of the pace of everyone ahead of him on the GC, but fortunately for him those behind weren't faring any better. This is an original watercolor and ink postcard that is available for purchase through my artist website at www.greigleach.com For this particular painting you can follow the direct link at the end of this post. 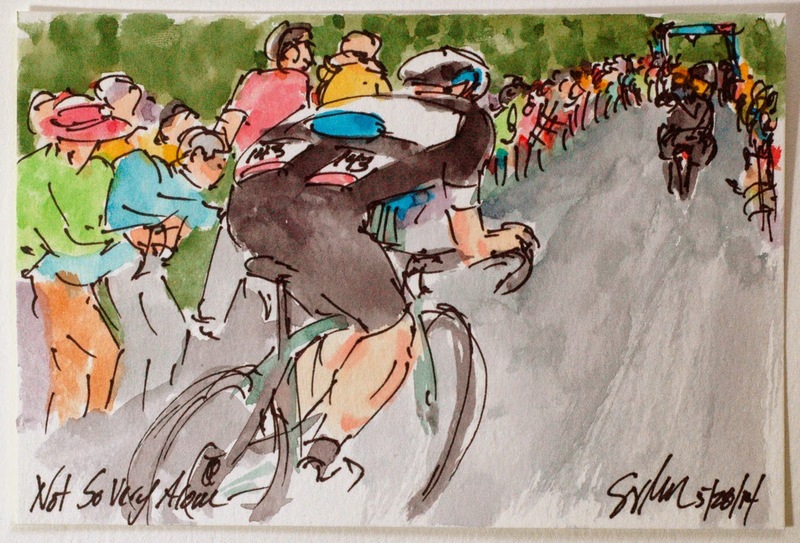 But while you are there, why not take the time to browse around at all of the cycling art on offer? All of these small watercolors are only $50 USD and I will ship them any where in the world (all ready have sent them to most countries in Europe and the far East). After climbing to massive mountains and covering 150 kilometers and over 1500 kilometers thus far in the Giro d'Italia, the break away was about to start up the most hellish mountain in a Grand Tour. In case they weren't aware of how much they were about to suffer, they were encouraged along by the Devil by the side of the road. 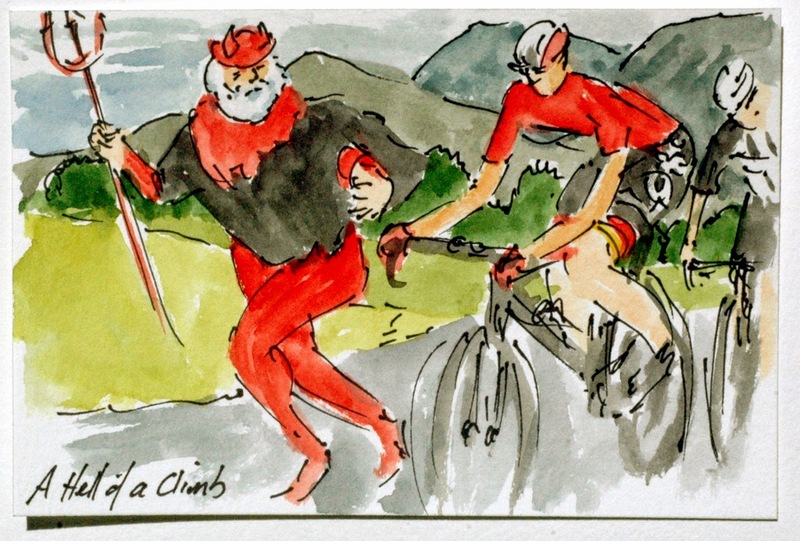 The Devil has long been a figure in every stage of the Tour de France, and it is a pleasure to see him healthy again, using his new knees to drive the peloton on. Chapeau! At this point, Tim Wellens (Lotto-Belisol) is leading a small group of the front, a place he has been for the last couple of stages. This is an original watercolor and ink postcard that is available for purchase through my artist website at www.greigleach.com. For this particular original painting, just follow the direct link at the end of this post, but don't delay, it is a one of a kind. And only $50 USD! 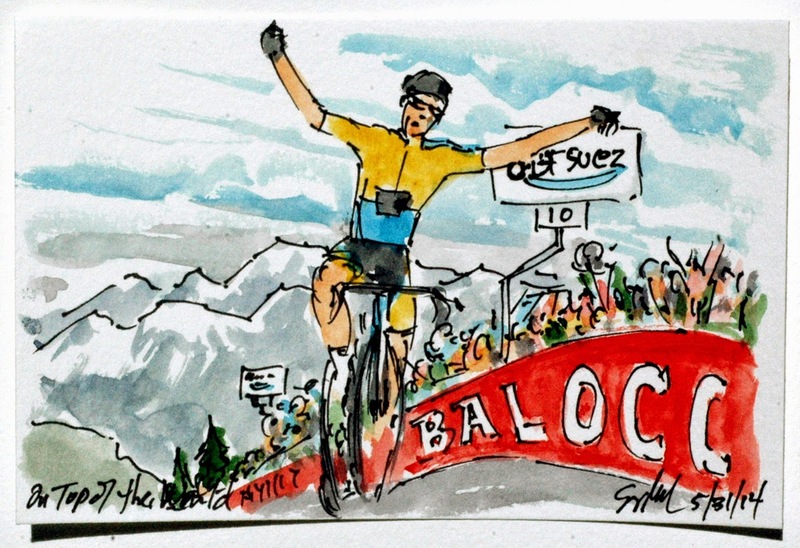 After taking second over the summit of the Sella Razzo, Brent Bookwalter (BMC) was joined on the speedy descent by Jonathan Monsalve (Neri Sottoli). The pair hoped to get away from their break away companions and gain a head start up the final climb of the day and the Giro. They were facing a 10 kilometer climb that had some 22% gradient sections, so any extra time would be a great asset. This is an original watercolor and ink postcard that is available for purchase through my artist website at www.greigleach.com. For this particular painting, please follow the direct link at the end of this post. 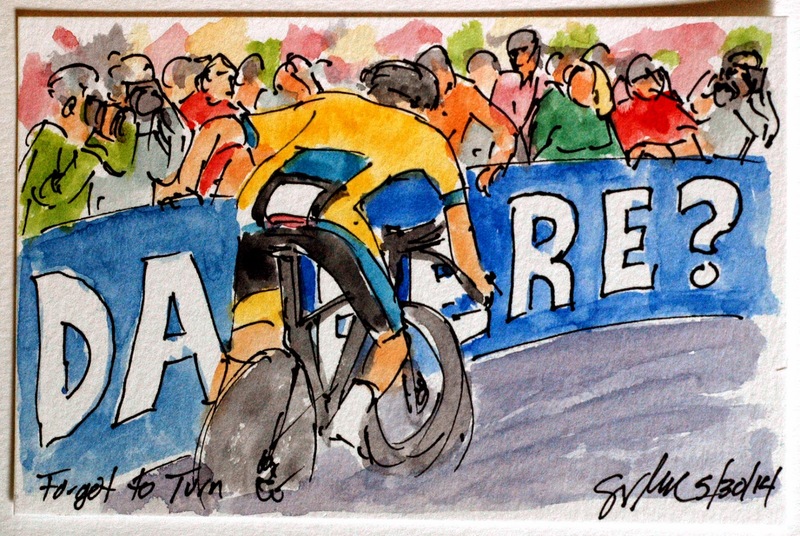 Tinkoff Saxo managed to get two men into the big break of the day which put them in a very competitive advantage, particularly when Mick Rodgers over shifted his chain into the rear spokes requiring a new bike. Without Nicholas Roche to help pace him back to the others, he would never have had a hope of seeing the break away again. 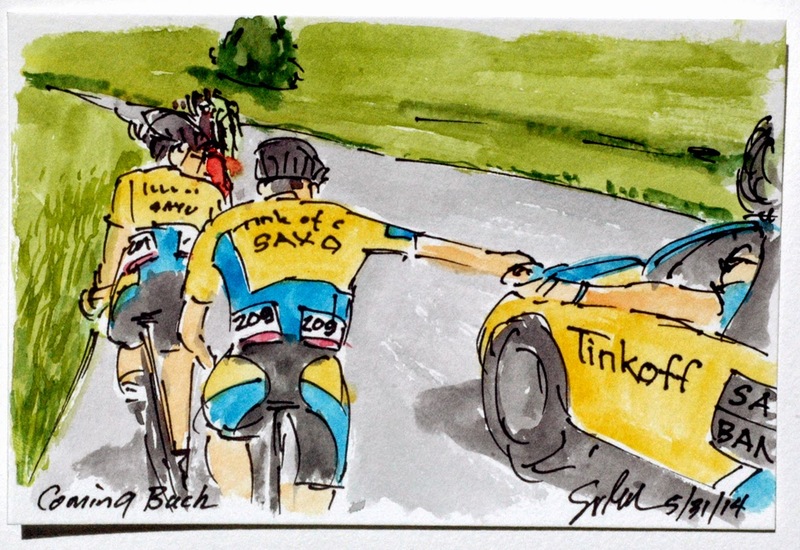 Once Roche had pulled him back, his Director Sportif passed him a bottle and led them get on with the job at hand. This is an original watercolor and ink postcard (4"x6") that is available for purchase for only $50 USD at my artist website, www.greigleach.com. 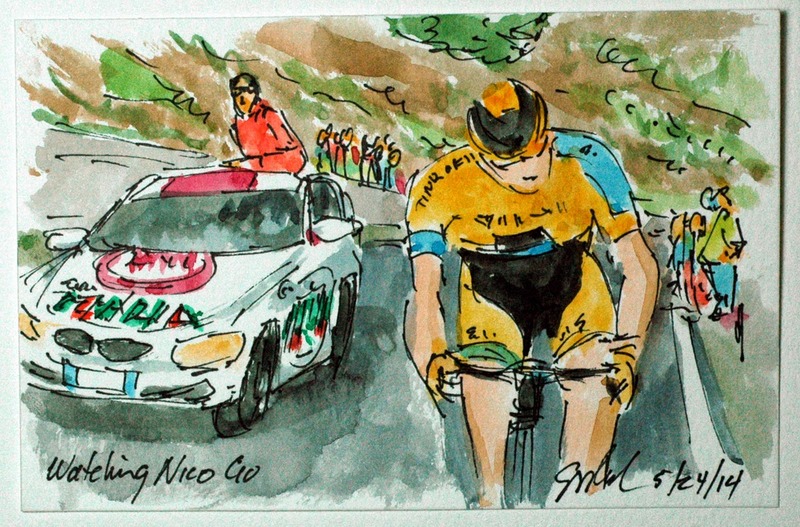 For this particular painting just follow the direct link at the end of this post to get your piece of the 97th Giro d'Italia. With all of the inventions in bicycles, frame technology, gearing, shifters and clothing, some of the old techniques are still the best. Robinson Chalapud (Team Colombia) about to descent the Passo del Pura stuffs a 'Il Gazetta' up the front of his jersey to keep out the chill. Having generated a lot of heat and sweat trying to bridge across to the day's break away it is vital to keep his chest warm on the descent where speeds over 60 kph create a substantial wind chill. Several riders have been plagued with respiratory problems and fevers, some even going home unable to perform. This technique is so respected that Europcar's soigneur is waiting to pass some papers to his riders. This is an original watercolor and ink postcard measuring 4 inches by 6 inches that was created using Yarka St. Petersburg watercolors and Steve Quiller brushes from www.richesonart.com. This painting is available for purchase through my artist website at www.greigleach.com. For this particular painting you can follow the direct link at the end of this post. But while you are there, why not take the time to browse around at all of the artwork on offer? Nairo Quintana (Movistar) could have just checked his time splits against Rigoberto Uran (OPQS) and made sure he didn't lose too many seconds and still be in Pink at the end of the day. But then most athletes can't do that, it is in their blood to win if at all possible. So instead of playing it safe, Quintana laid down the best time taking the stage win and adding over a minute to his lead over Uran, all but insuring his holding the Maglia Rosa on the final day. 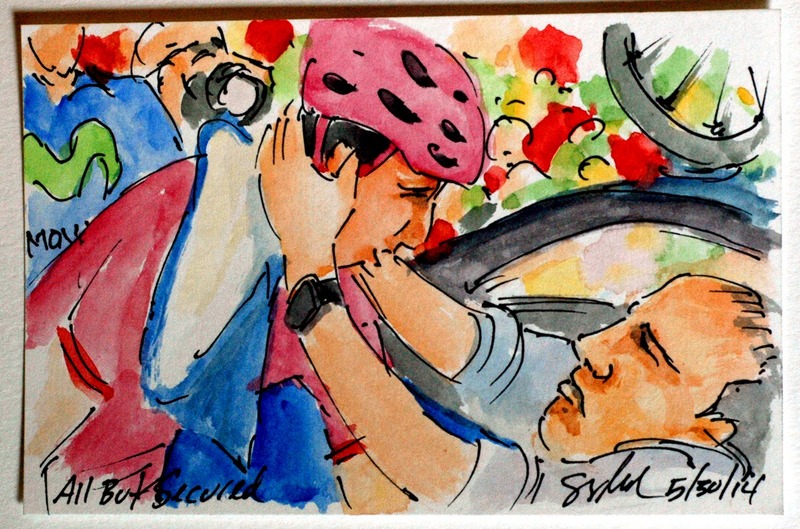 There was great joy at the finish line and a big hug through the Movistar team car window from his Director Sportif. I can imagine him saying, "That was beautiful, this race is all yours!" This is an original watercolor and ink postcard that is available for purchase through my artist website at www.greigleach.com. For this particular painting just follow the direct link at the end of this post. Fabio Aru (Astana), holding the Maglia Blanco for Nairo Quintana (Movistar) went out in hopes of moving up the General Classification with a great storming ride up the side of the mountain. Being the best place Italian in the race, the tifosi lining the entire 26.8 kilometers of the climb screamed, danced, and ran with their man, encouraging his every pedals stoke to ever greater speeds. Aru was in the Blanco even though Quintana is the best placed young rider, but it would be silly to wear two jersey at the same time. It is stunning to watch the crowd part as their man rides up the mountain, so times not as quickly as they should. It is questionable if those blocking the way cost more seconds than their encouragement gained. This is an original watercolor and ink postcard that is available for purchase through my artist website at www.greigleach.com for only $50 USD. For this particular painting just follow the direct link at the end of this post. During the course of any Time Trial, there are designated sites where split times are taken, as Domenico Pozzovivo (AG2R) crossed the second split point, he held the best time thus far. He maintained the quality of the run all the way to the top of the Cima Grappa, alas, there were faster guys coming up the mountain behind him. But the ride was good enough to move him up to 5th place overall in the Giro d'Italia. This is an original watercolor and ink postcard that is available for purchase through my artist website at www.greigleach.com. For this particular painting, please follow the direct link at the end of this post. 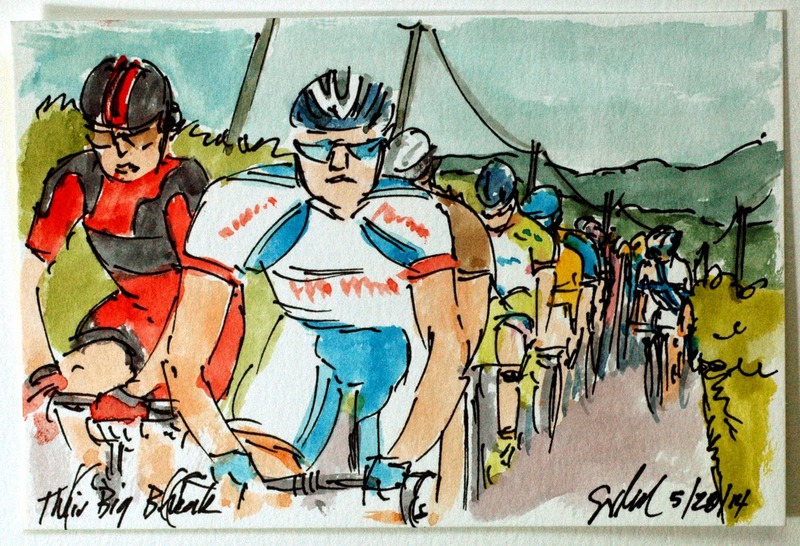 But why not take the time to browse all of the cycling art on offer? Each competitor in a time trial pulls up to the start gate and his held upright while the crowd looks on and the officials count down to the moment when the legs need to do the talking. Nairo Quintana (Movistar) by virtue of holding the Maglia Rosa, is the last man to roll down the ramp and begin chasing everyone who has already rolled off towards the top of the mountain. With almost two minutes advantage over Rigoberto Uran (OPQS), Nairo could approach this ride defensively or he could go out and prove that his Pink Suit is rightfully his and that there is no controversy about his overall lead. This is an original watercolor and ink postcard that is available for purchase through my artist website at www.greigleach.com. For this particular painting, just follow the direct link at the end of this post. 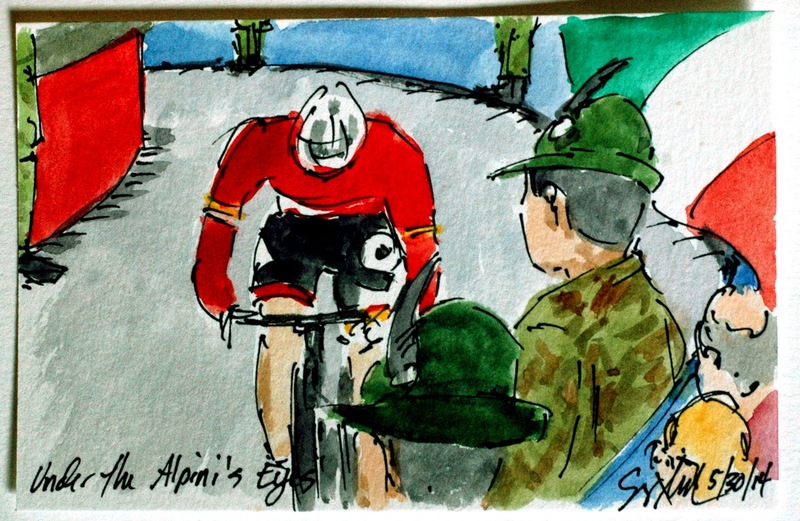 The Northern Italian soldiers or Alpini, are used by the Giro to police the barriers along the Alpine and Dolomite stages of the Giro d'Italia. It is a treat to watch them march down the course, taking up their positions along the route with their distinctive felt hats and feathers. But make no mistake, this is an elite force used to guard the American Embassy to the Vatican in Rome. Tim Wellens (Lotto-Belisol) was the next rider to come up the mountain with the new best time. Wellens has been on the attack on each of the previous mountain stages and still had enough energy to shake up the leader board. 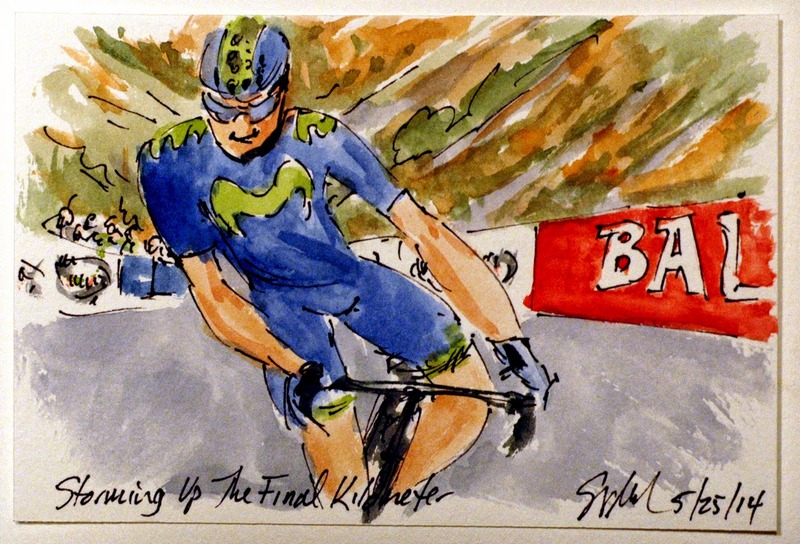 Again, posting the best time is no insurance of the over all stage victory, it is only when the last cyclist crosses the line that the stage winner can be determined. This is an original watercolor and ink postcard that is available for purchase through my artist website at www.greigleach.com. For this particular painting, please just follow the direct link at the end of this post. Some of the competitors decided to use their road bikes with aero bars, others decided to use a time trial bike and then trade out bikes once the road started up. The trade off being more speed in the flat section saving more time than the cost of seconds it takes to switch bikes. Rafal Majka (Tinkoff Saxo) sitting third in the Young Rider Competition, had quite a bit to ride for, but it seems that nerves or lack of concentration got the better of him. He appeared to completely forget to make a turn, almost colliding with the barriers and losing precious seconds in his quest to hold his position in the General Classification. This is an original 4'x6" watercolor and ink postcard that is available for purchase through my artist website at www.greigleach.com. For this particular painting you can follow the direct link at the end of this post, but why not browse around at all of the art on offer? Today's stage was another individual time trail, but this one was basically all up hill for 26.8 kilometers, not a stage you would expect a sprinter to do well in. But Sonny Colbrelli (Bardiani CSF) must have caught the winning spirit of the team, when he crossed the line he took over first place in the stage, again ON a mountain time trial! 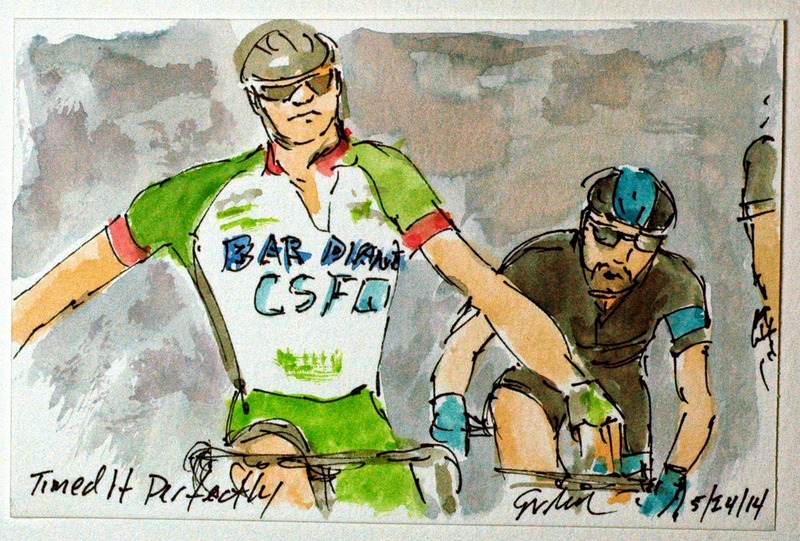 At his finish Bardiani CSF held the three top spots on the leader board. However, with each man riding against the clock, the rider with the best time has to wait for each following man to come in to see if his time stands. 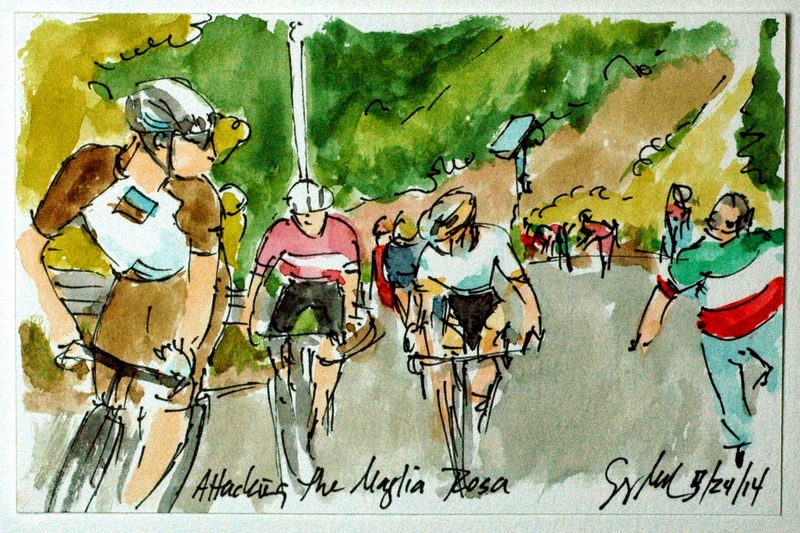 Unfortunately, for Colbrelli there were a lot of talented riders yet to climb up to the top of Cima Grappa. This is an original watercolor and ink postcard measuring 4 inches by 6 inches and created using Yarka St. Petersburg watercolors and Steve Quiller brushes from www.richesonart.com. Also this painting is available for purchase through my artist website at www.greigleach.com for only $50 USD. For this particular painting, just follow the direct link at the end of this post. The Giro has switched to being about the Colombian cyclists, today under the watchful eye of the Colombian Government's Director of Sport, Johan Davi Arredondo (Trek Factory Racing) all but secured his victory in the King of the Mountains competition. Today he took first over all three climbs of the stage including the mountain top finish of Rif Panarotta. Without too many more mountains to climb in the rest of the 97th Giro d'Italia, it is impossible for anyone to gain enough points to over take his lead and steal his Maglia Azzuro. This is an original watercolor and ink postcard that measures 4 inches by 6 inches and is available for $50 USD through my artist website at www.greigleach.com. 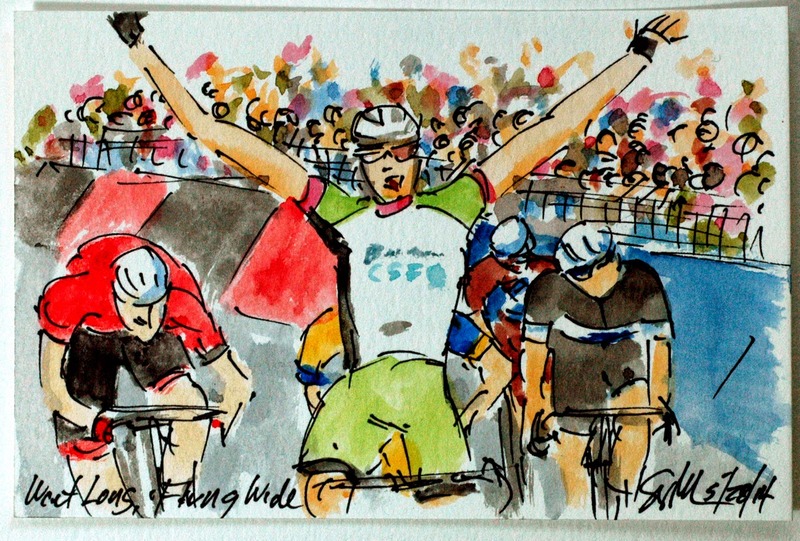 For this particular painting just follow the direct link at the end of this post to get your piece of the 97th Giro. Few riders have been more animated than Pierre Rolland (Europcar) and today was no exception. He started the day in fourth place by virtue of the work he has done on the previous stages, with just a few kilometers left to go up Rif Panarotta he charged off away from the Gruppo Maglia Rosa in search of seconds. 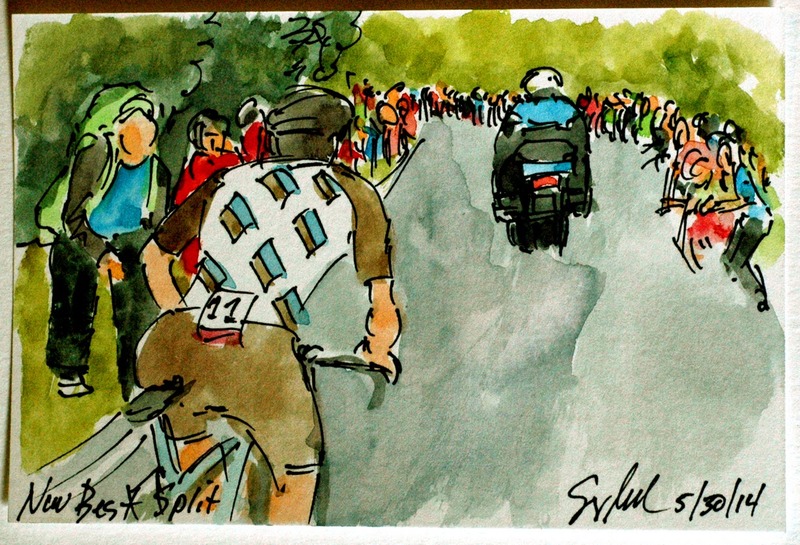 The break was too far up the road for him to hope for the as yet elusive stage victory. As Pierre went off the front, Cadel Evans (BMC) went off the back, so Rolland is riding himself onto the virtual podium. This is an original watercolor and ink postcard that is available for purchase through my artist website at www.greigleach.com For this particular little 4"x6" painting, just follow the direct link at the end of this post. If the first week of the Giro was the Giro d'Australia the final week has became the Giro de Colombia. 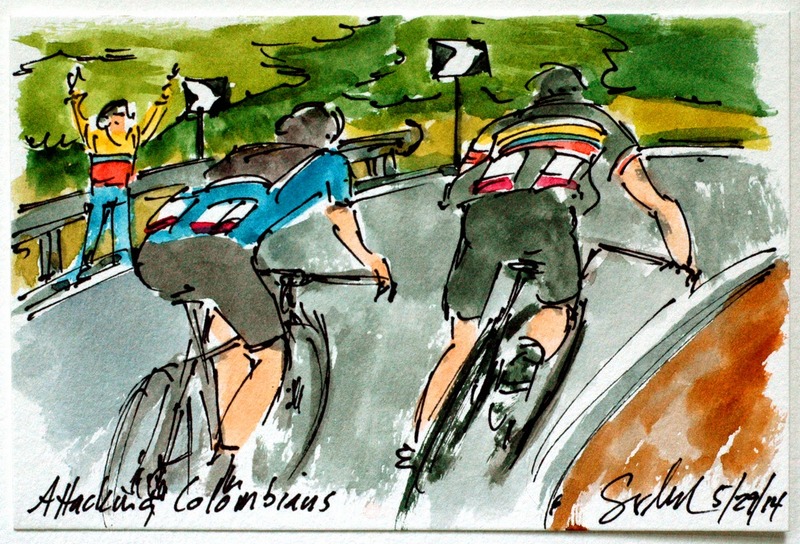 Colombians hold first and second place overall, and they hold the Maglia Azzuro of the King of the Mountains, and Team Colombia has been present in virtually ever break away in every stage. Today's stage included Johan Davi Arredondo's (Trek Factory Racing) cementing his ownership of the KOM Jersey with taking the first two climbs of the day (and here he is looking to make it three out of three), however he is being challenged by his countryman, Fabio Andres Duarte (Team Colombia). Now, along all of the roads of Italy are very happy Colombian fans proudly waving their flag and celebrating with abandon. Who knew there were so many Colombians in Europe. This is an original watercolor and ink postcard that is available for purchase through my artist website at www.greigleach.com. 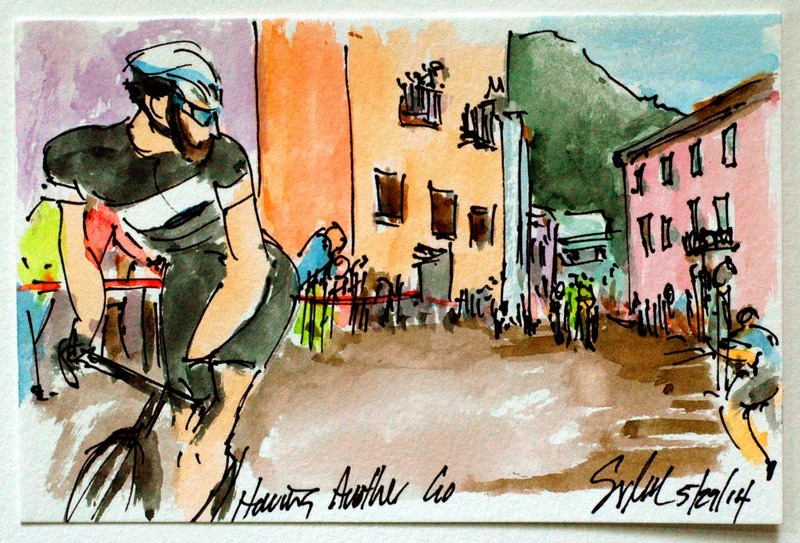 For this particular painting follow the direct link at the end of this post to get your piece of the 97th Giro d'Italia. Thomas De Gendt (OPQS) has been very active in the final week of the Giro d'Italia, going on a long break yesterday and back at it again today. This time he has been caught and gone again several times. This assault was sprung as they road through the narrow streets of the final climb up to Rif Panarotta in a 15% gradient section of pave. He left behind some guys with some very strong climbing pedigree. I must say I enjoy the move to beards amongst some of the men of the peloton, ironically paired with shaved legs. This is an original watercolor and ink postcard that is available for purchase through my artist website at www.greigleach.com For this particular painting you can follow the direct link at the end of this post. Oops, these first three post are out of order, this is the first image for Stage 18. Johan Davi Arredondo (Trek Factory Racing) set himself the objective of securing his lead in the King of the Mountains competition and follow that up with getting into the break of the day on the first climb. 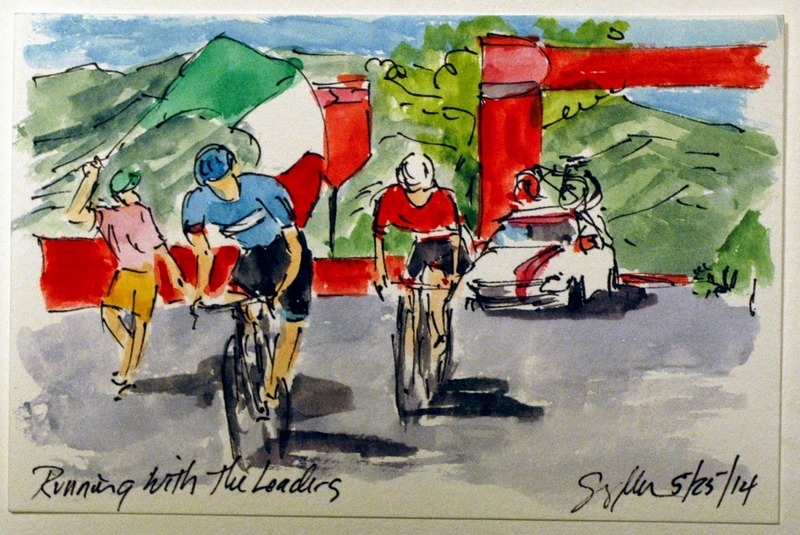 So with less than two kilometers to go before the summit of San Pelligrino (my favorite soda), he checked over his shoulder and jumped away from Emanuelle Selle (Androni-Giacattoli) and Philip Deignan (Team Sky) to claim the 32 points at the top. This is an original watercolor and ink postcard that is available through my artist website at www.greigleach.com. 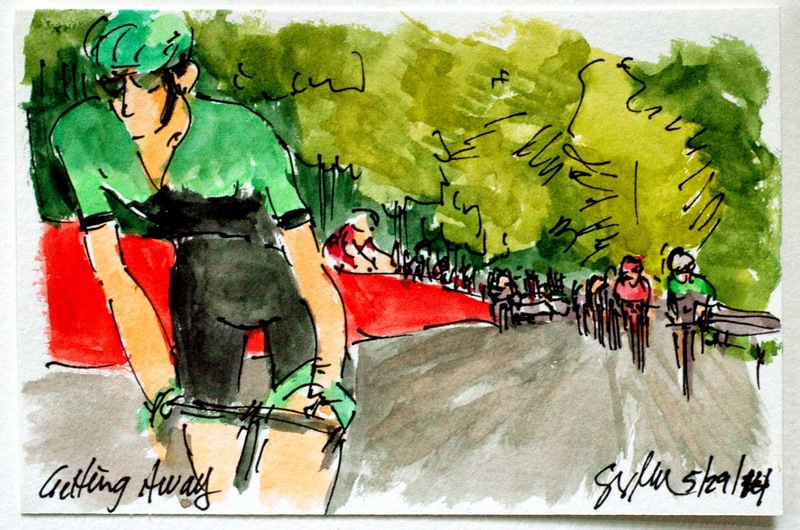 For this particular painting, just follow the direct link at the end of this post to get your pieces of the 97th Giro d'Italia. Along every road stage, there is a designated Feed Zone, where the team soigneurs hand out Musettes to the passing cyclist. The trick is to hold the bag loosely aloft and their riders grab the straps of the bag, sling them over there shoulders, and rummage through like a kid going through their Christmas stocking. An average cyclist will burn upwards of six thousand calories in an average Grand Tour Stage, so keeping them topped up is a challenge during the course of the race. It is vitally important, Pierre Rolland (Europcar) claimed that he it a "food block" during yesterday's stage ruining his chances of a stage win, leaving him to come in a distant third. This is an original watercolor and ink postcard (4"x6") that was created using Yarka St. Petersburg watercolors and Steve Quiller brushes from www.richesonart.com. In addition, this painting is available for purchase through my artist website a www.greigleach.com for $50 USD. For this particular painting, just follow the direct link at the end of this post. With another day of big climbs facing the peloton and the General Classification from third to tenth place separated by less than two minutes, it was going to be a big day of racing. Oddly enough it would also be a day for the break away riders, assuming they didn't threaten those top ten placings. Ivan Basso (Team Cannondale) went off early hoping to reclaim some of his past glory, he has won the Giro twice before. He was joined by 13 other riders including the escapee from yesterday, Thomas De Gendt (OPQS). 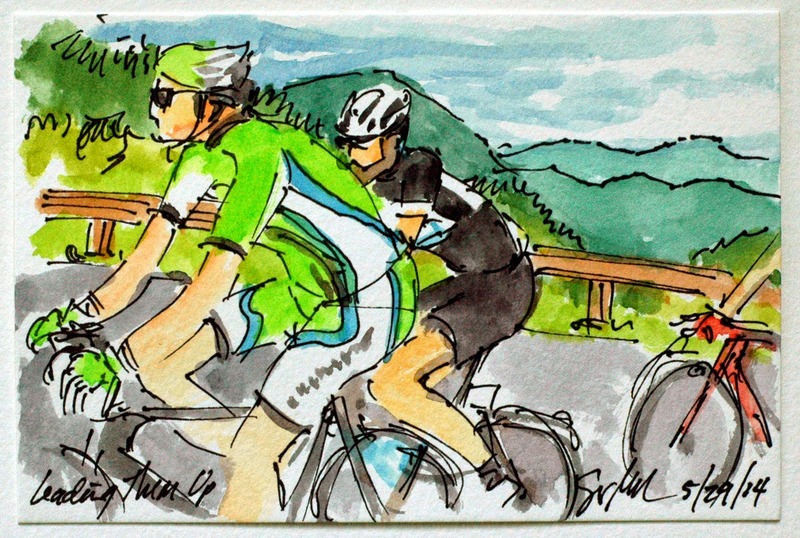 These two are rolling through their turns on the climb up the Passo del Rebebus. This is an original watercolor and ink postcard measuring 4 inches by 6 inches. 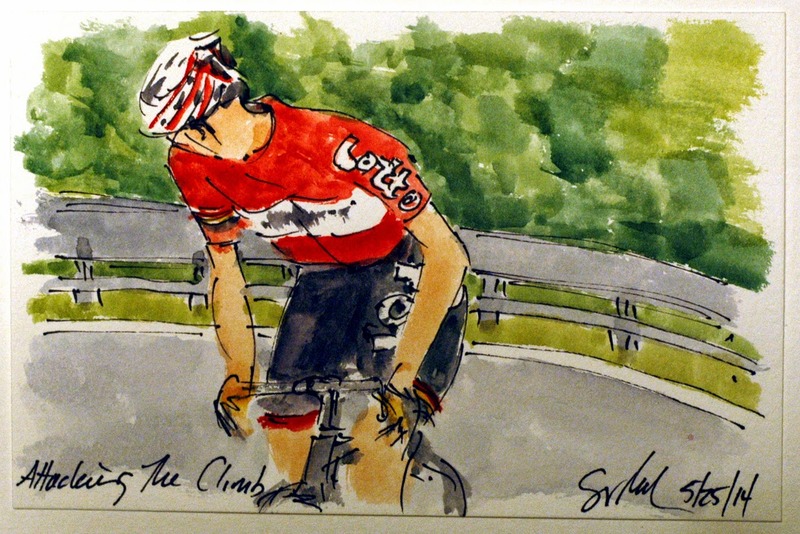 This painting and, in fact all of my cycling art, is available for purchase through my artist website at www.greigleach.com. For this particular painting, just follow the direct link at the end of this post. But while you are there, why not look around at all of the artwork on offer? A group of four caught Thomas De Gendt (OPQS) and the five headed for the line together. Stefano Pirazzi (Bardiani CSF) having gambled and got into the break along with two teammates, rolled the dice again on a long sustained push into Vittorio Vente for the win. The others, Thomas De Gendt, Tim Wellens (Lotto-Belisol), Jay McCarthy (Tinkoff Saxo) and Mattelo Montaguti (AG2R) were all kicking themselves for gambling on not chasing the Italian. Pirazzi's victory makes three stage wins for the Italian Wild Card team, more than enough to show their appreciation for being invited to the party. This is an original watercolor and ink postcard that is available for purchase through my artist website at www.greigleach.com. 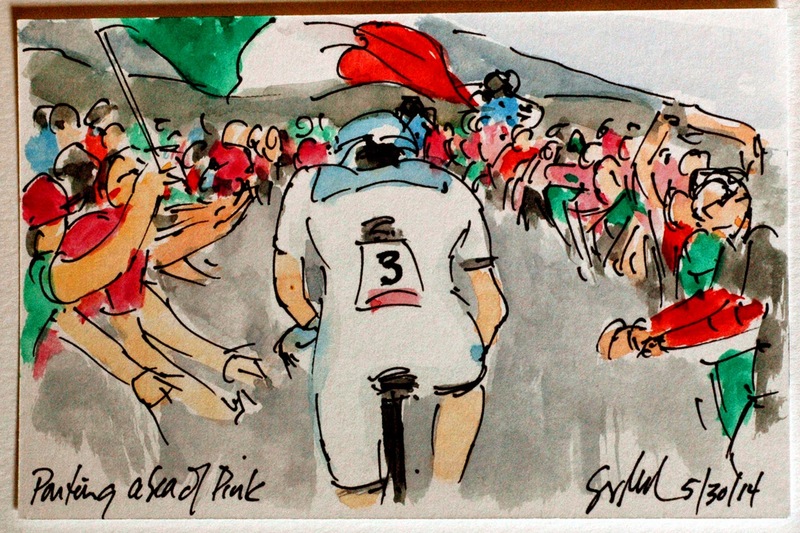 For this particular painting, just follow the direct link at the end of this post to get your little piece of the Giro d'Italia. With a break away up the road by 14 minutes and none of the members of that group within a half hour of Nairo Quintana's (Movistar) time, the peloton just let them run. Back in the group with Movistar on the front of the peloton, they warned every one to slow down on the wet descent off of the Ca' del Poggio. I am sure these men have had enough of slippery wet roads, crashes and road rash. With no need to ride hard, there was no reason to risk anything on the twisting descent. This is an original watercolor and ink postcard that is available for purchase through my artist website at www.greigleach.com. For this particular painting you can follow the direct link at the end of this post. 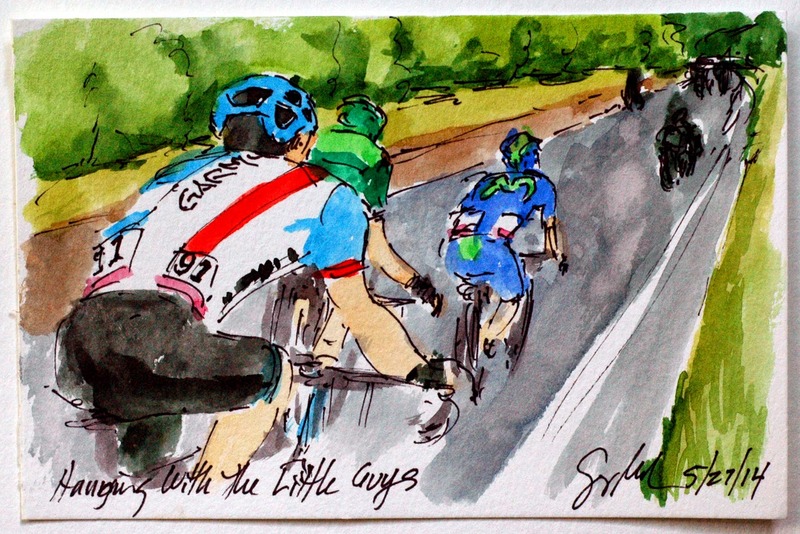 While nothing like the Gavia or the other climbs of Stage 16, or for that matter like what is still to come, the Ca' del Poggio was a very steep short climb, just the place for Thomas De Gendt (OPQS) to launch an attack from his fellow break away riders. The Italian fans turned out by the thousands to watch their heroes make the climb, so while he was alone on the road, he had plenty of company along the way. This is an original watercolor and ink postcard that is available for purchase through my artist website at www.greigleach.com. For this particular painting you can follow the direct link at the end of this post. While you are there, why not take the time to browse around at all of the artwork on offer. Sorry, I couldn't resist the pun. The break away formed around 50 kilometers into the stage today with 26 riders representing all but three of the teams in the race. Even Movistar, the team that holds the Maglia Rosa, placed one of their men into the group. Marco Frapporti (Androni-Giacattoli), the last to get across from the peloton, led this group with Daniel Oss (BMC) on his wheel. Behind you can make out the Finnish flag on the chest of the Finnish National Champion, Jussi Veikkenan (FDJ). He has finished doing his pull on the front of the group and now rolls to the back to get shelter from the wind, until it is his turn to stick his nose in the wind again. By now the break had built up a lead of 13 minutes and the peloton just didn't seemed to want to chase, after all, the highest place rider was over a half hour down on the Maglia Rosa. This is an original watercolor and ink postcard that is available for purchase through my artist website at www.greigleach.com. For this particular painting, you can just follow the direct link at the end of this post. No rider, no team leader can win a race on their own. It takes a complete team of helpers, from mechanics to chefs, masseuse to coaches, and domestiques to office personel, to get a team leader high up in the General Classification. The on board race mechanic is passing over a replacement bike to Enrico Gasparotto (Astana) so he can get going again swiftly. He was in the early break of the day, and definitely didn't want to be left behind. He felt sure that the stage winner would come from the break away and the only way he could have a chance was to get back into the break, quickly. This is an original watercolor and ink postcard that is available through my artist website at www.greigleach.com. 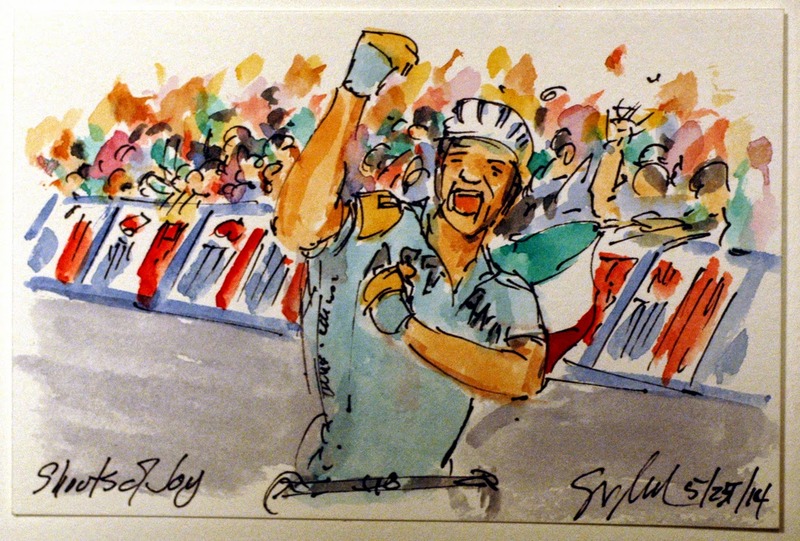 For this particular painting follow the direct link at the end of this post to get your piece of the Giro d'Italia. After the day the peloton had yesterday, there was quite a bit to talk about along the roads to Vittorio Venete. Like any group of cyclist I know, there is lots of talk about the tough rides we have taken and Stage 16 of the Giro d'Italia was one of the toughest, three big climbs and all kinds of weather on top of it. Oscar Gatto (Cannondale) had the time to regale Daniel Oss (BMC) and Luca Paolini (Katusha) with his take on the intrigue about whether there was a neutralization or not. 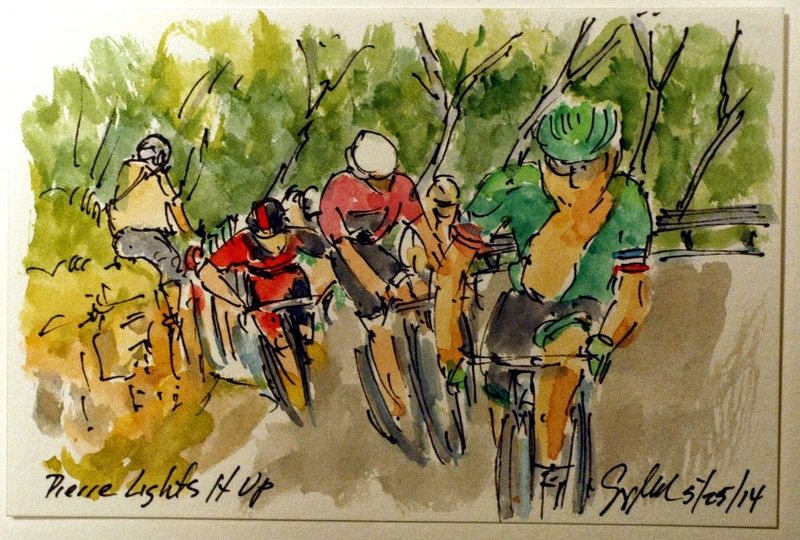 This is an original watercolor and ink postcard, measuring 4 inches by 6 inches and was created using Yarka St. Petersburg watercolors and Steve Quiller brushes from www.richesonart.com, Also, this painting, and all of my cycling art, is available for purchase through my artist website at www.greigleach.com. Each little painting is only $50 USD. For this particular painting, just follow the direct link at the end of this post. Wow! That is about all that needs to be said about Nairo Quintana's (Movistar) performance today. And the same can be said for the man a few seconds behind him, Ryder Hesjedal (Garmin Sharp). Having battle illness through the first two thirds of the Giro, Quintana has been chipping away at the leads of those ahead of him on GC. While there will be quite a few discussions about his attacking the descent of the Stelvio, it can't be denied that he rode away from everyone on the final climb. Even if he had been with Evans and Uran, I am sure he would have gotten away regardless. 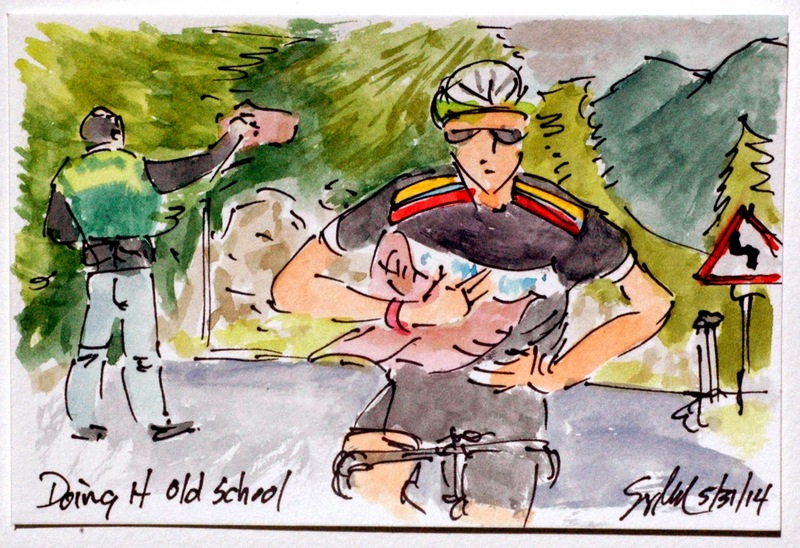 Maybe his lead might have been less, but he earned his new pink jersey with authority. Coincidently, he alos took the lead in the Maglia Blanco as the rider 23 and under with the best time. In 2013, he won that jersey and the King of the Mountains Polka Dot Jersey in the Tour de France. Ryder earned a couple of moves up the GC for his ride and Rolland managed to get third on the stage, still looking for the elusive stage win. This is an original watercolor and ink postcard that is available for purchase through my artist website at www.greigleach.com. For this particular painting follow the direct link at the end of this post. Ryder Hesjedal (Garmin Sharp), who won the Giro d'Italia in 2012, was a good bit larger than the two climbers he teamed up with at the front of the race. But he knew he had caught the right wheels for the day, Pierre Rolland (Europcar) had been attacking every stage and was still in search of a stage victory, and, Nairo Quintana (Movistar) was on a tear, looking to gain as much time on all of the GC contenders he possibly could. At this point on the lower slopes of the final climb he was only forty seconds down on Uran after starting a two and a half minutes down on his fellow Colombian. This is an original watercolor and ink postcard measuring 4"x6" and is available for purchase through my artist website at www.greigleach.com for only $50 USD. For this particular painting, just follow the direct link at the end of this post. First Dario Cataldo (Team Sky) then a number of others including Movistar and Nairo Quintana (Movistar) decided to race down the mountain. Apparently the weather warmed at the summit, and while the roads were dangerous and wet, they were not icy. At some point the decision was made to let the riders race. And race they did! Pierre Rolland (Euorpcar), Nairo Quintana, and Ryder Hesjedal (Garmin Sharp) amongst others got a gap on the Gruppa Maglia Rosa, and then pressed their advantage as the valley floor gave way to the final climb. Quintana started the day two and a half minutes down on Rigoberto Uran (OPQS) and his Maglia Rosa. Rolland was hovering at the bottom end of the top ten, but both men had a lot to gain by getting as far up the road as possible. This is an original watercolor and ink postcard that is available for purchase through my artist website at www.greigleach.com. For this particular painting, just follow the direct link at the end of this post. Most teams thinking that the descent has been neutralized, stop after crossing the summit to add more layers of warmer, dryer clothing. Figuring that the time it took didn't matter, many let their soigneurs wrap them up, tuck in their scarves in, and zip up their jackets. Notice that it is a fan along the side of the barriers who is holding Alexandre Geniez's (FDJ) bike while he dresses for the descent. Of course with these weather conditions, hyperthermia was a very real possibility, and a little lost time was far better than a trip to the hospital and then home. This is an original watercolor and ink postcard that is available for purchase through my artist website at www.greigleach.com. For this particular painting, just follow the direct link at the end of this post. 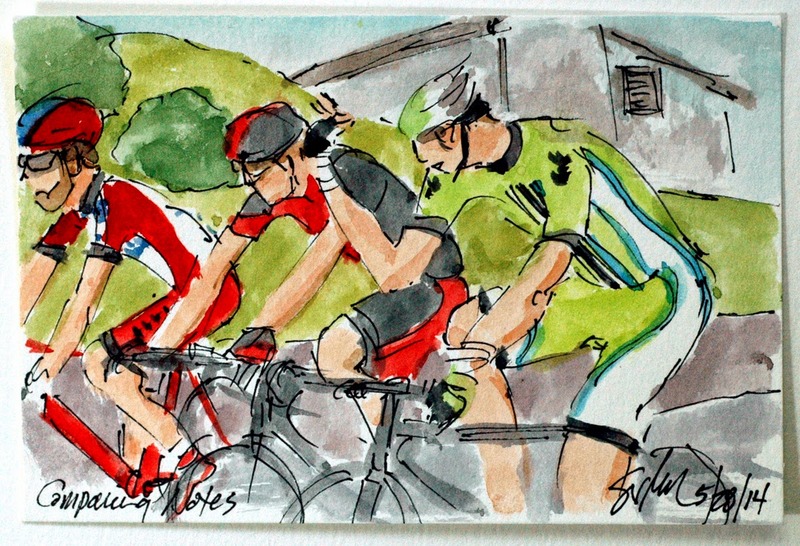 While you are there, why not take the time to browse around at all of the cycling art on offer? Dario Cataldo (Team Sky) and a few others were finally allowed to slip off of the front of the peloton, Cataldo took full advantage. 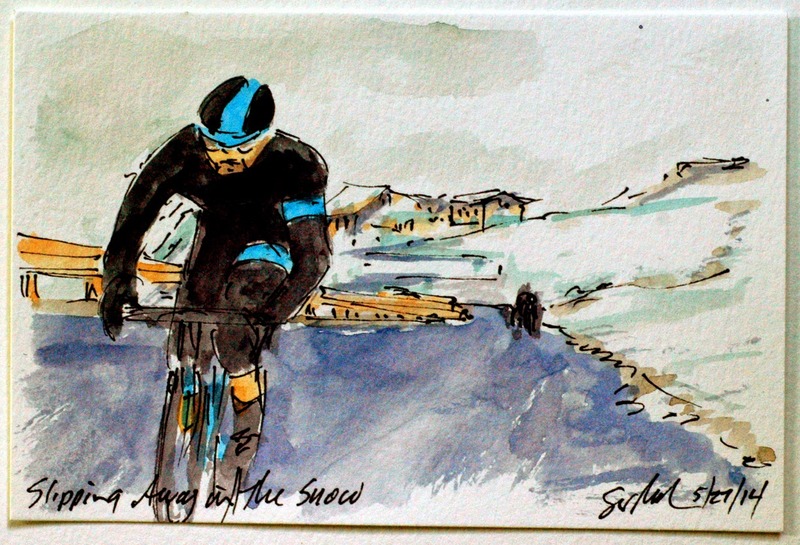 With the rain having changed over to snow, not many were happy in the race and concern started growing about the safety of the descent down the back side of the Stelvio. At one point, I received a tweet that the race organizers had decided to neutralize the drop down the other side. The idea being that the times of each rider would be taken at the summit, this would allow the riders to take there time going down, hopefully staying safe on the icy twisting hairpins down to the valley floor. At the bottom, the peloton would stop, starting back off in the time order that was established at the summit. Confusion reigned as it became apparent that the decision to neutralize had been rescinded. As of this writing, I don't know the results of the arguments that were sure to follow. This is an original watercolor and ink postcard that is available for purchase through my artist website at www.greigleach.com. For this particular painting, please follow the direct link at the end of this post. Giro d'Italia Stage 16: Will They Chase? 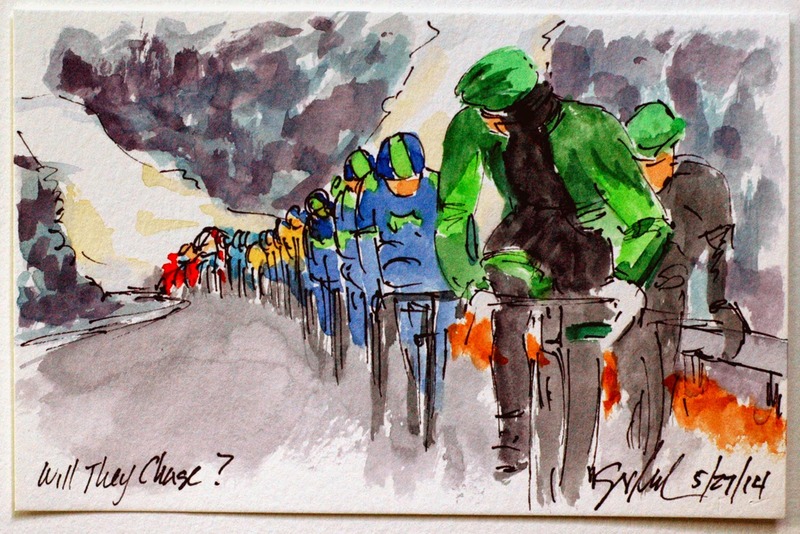 Well bundled against the cold, Pierre Rolland (Europcar) had promised to attack on the Gavia, the first climb of the day. However, it wasn't until the next climb, the famed Stelvia, that he went to the front of the peloton and tested the resolved of Movistar. He hoped to slip away from the GC favorites while they were busy marking each other. 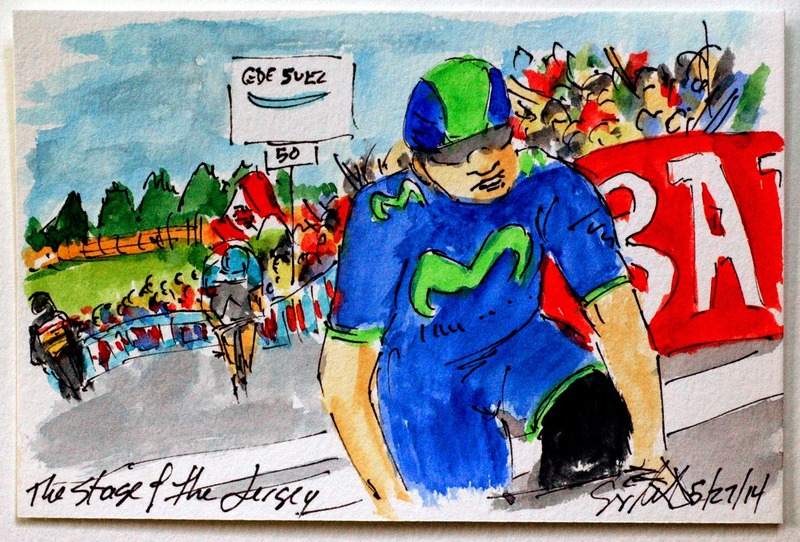 To his disappointment, Movistar had a plan and the strength in numbers to back it up. They weren't willing to let anyone get off of the front. This is an original watercolor and ink postcard that can be yours by visiting my artist website at www.greigleach.com. For this particular painting, please follow the direct link at the end of this post. 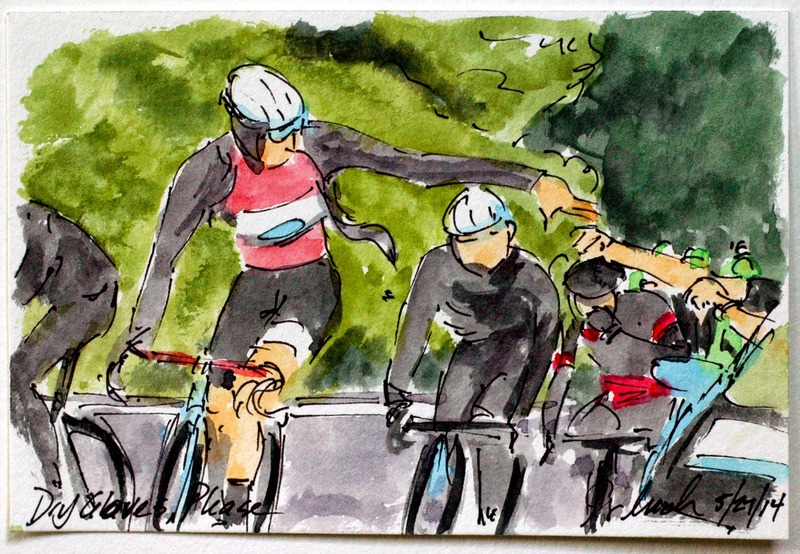 With the near constant drizzle and the spray coming up off of the wheels of his fellow cyclists, the Maglia Rosa wearing Rigoberto Uran (OPQS) found it difficult to keep his hands dry and warm. 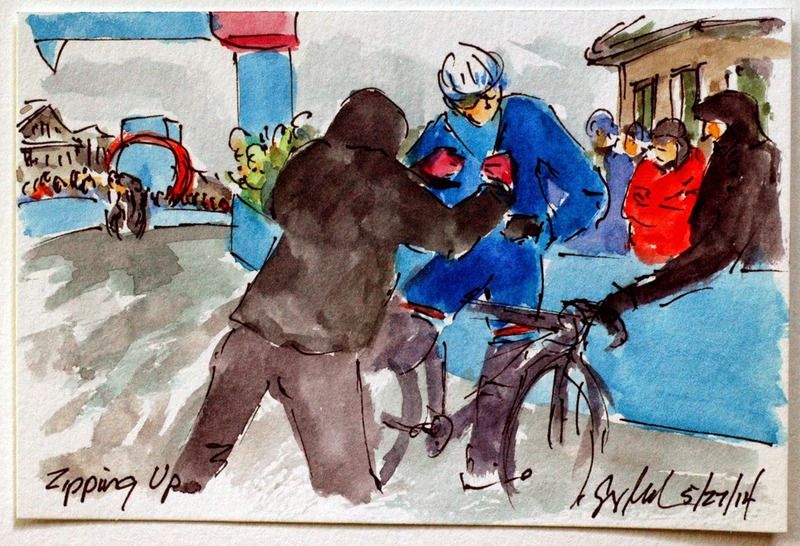 With the top of the Stelvio (the highest point of the 2014 edition of the Giro d'Italia) still miles away, he reached out to his team car for some new, warm, dry gloves. While it looks like a gesture of distain, he is actually about to grab the fresh pair of toasty gloves. This is an original watercolor and ink postcard that is available for purchase through my artist website at www.greigleach.com For this particular painting you can follow the direct link at the end of this post. The painting measures 4"x6" and sells for $50 USD. 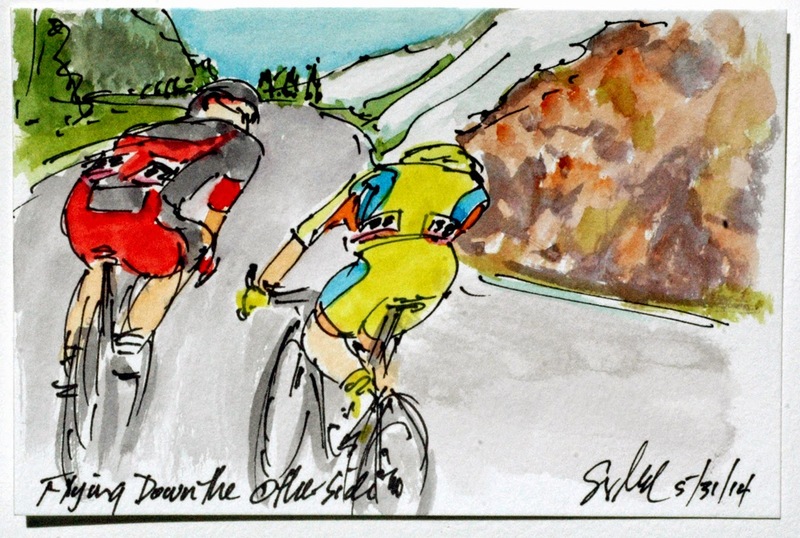 With three big mountains to climb in today's stage from Ponte di Legno 139 kilometers to Val Martello/Martellal, you knew some Colombian climbers would figure into the day's drama, but the weather wasn't in the mood to play second fiddle. True to form, Robinson Chalapud from Team Colombia was the first to head out from the peloton on the first climb up the Gavia Pass. The ride up was cold and drizzley with snow along the sides of the road, but at least the temperature stayed above freezing. With so much to play for behind, Chalapud never got more than 20 seconds on the attentive peloton. This is an original watercolor and ink postcard measuring 4 inches by 6 inches and created using Yarka St. Petersburg watercolors and Steve Quiller brushes from www.richesonart.com. This painting is available for purchase through my artist website at www.greigleach.com for only $50.00 USD. For this particular painting, just follow the direct link at the end of this post. While you are there, why not take the time to browse around and see all of the artwork on offer? Fabio Aru (Astana) has gone on the attack every time the road went up. Until Montecampione, his attempts had come up empty, but not today. His efforts bore the fruit that had thus far been denied Astana, the most valued stage win. Astana's Vincenzo Nibali won last year's Giro and up until today, Astana hadn't even figure near the top of the leader boards of both the General Classification and the Stage Podium. Aru crossed the line pumping his fists and shouting his unbridled joy cheered on by the shouts of the thousands of cycling fans lining the final meters of the climb. This is an original watercolor and ink postcard that measures 4"x6" and sell through my artist website (www.greigleach.com) for only $50 USD. 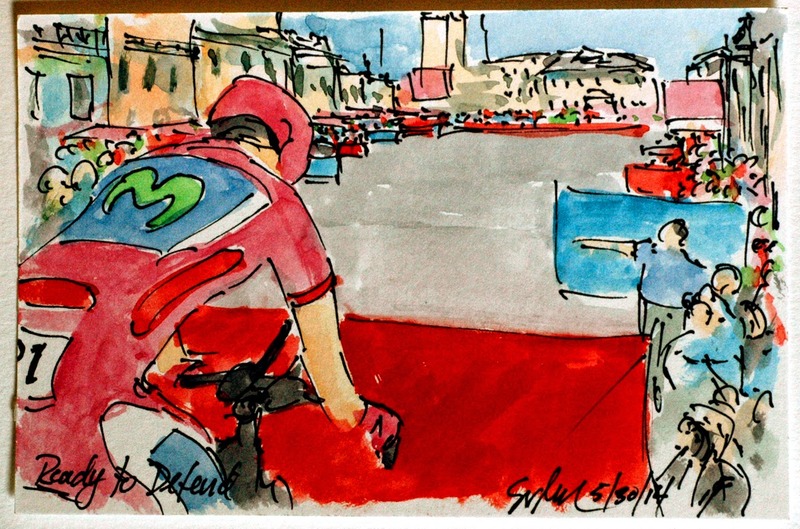 For this particular painting, follow the direct link at the end of this post to get your original painting of the Giro d'Italia. Nairo Quintana (Movistar) is obviously feeling much better and has set about gaining time back on those atop him on the leader board. 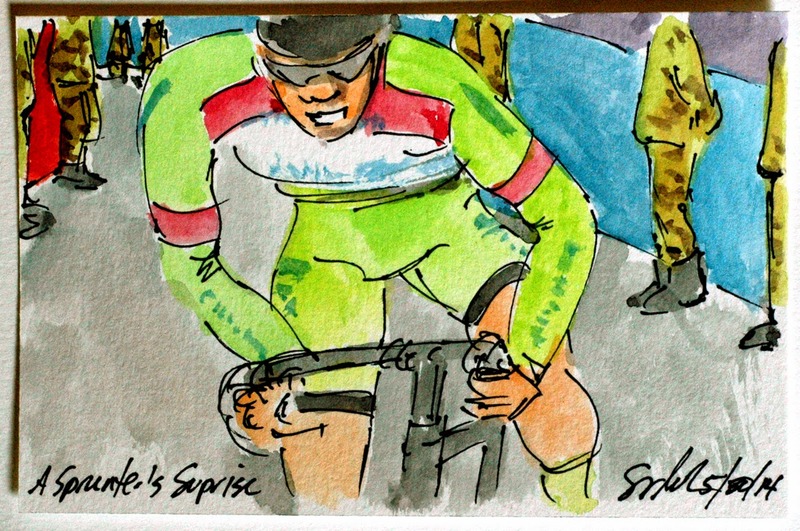 The Maglia Rosa of Rigoberto Uran (OPQS) was able to hang onto his Colombian countryman's wheel for awhile but as they went under the flame rouge as Quintana was on a mission. In the end he lost a little time to the stage victor, Fabio Aru (Astana) but gain time on every other rival in the Giro d'Italia. He put another 25 seconds into the Pink Jersey bringinng him under three minutes down. With five more stages in the mountains, he is on schedule to catch the Pink prize. This is an original watercolor and ink postcard that is available for purchase through my artist website at www.greigleach.com. For this particular painting, just follow the direct link at the end of this post. 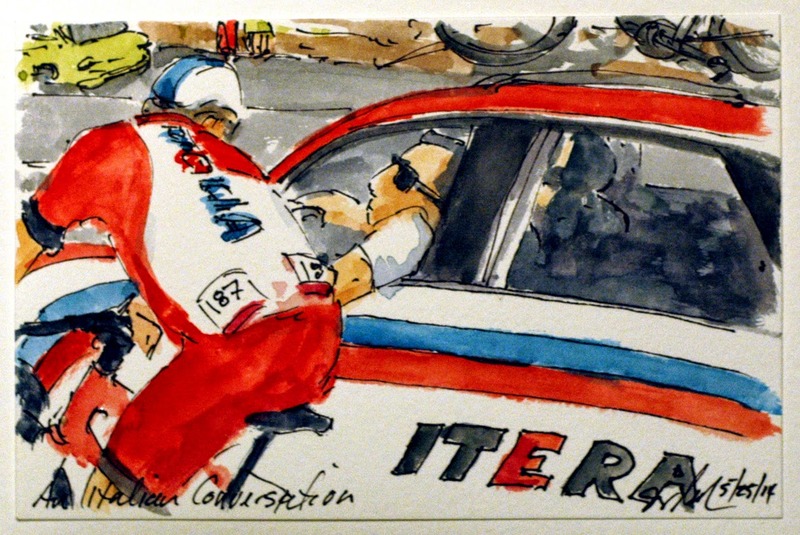 Giro d'Italia Stage 15: Did They Let Us Go? Pierre Rolland (Europcar) quickly caught up with the unzipped jersey of Philip Deignan (Team Sky). He check back over his shoulder to see what the gap was back to the peloton. At this point he was wondering if the main players had decided to let him go. Rolland is about 5 minutes down on the General Classification, so the Pink Jersey of Rigoberto Uran (OPQS) won't be interested in using the energy required to chase down the Frenchman or his Irish companion. This is an original watercolor and ink postcard that is available for purchase through my artist website at www.greigleach.com. For this particular painting just follow the direct link at the end of this post. Pierre Rolland (Europcar) was the next to decide the peloton was too busy watching each other and head out on his own. However, the Maglia Rosa, Rigoberto Uran (OPQS) and Cadel Evans (BMC) thought that the Frenchman should be followed and stood up to catch the fast accelerating Rolland. Perhaps unknowlingly, he set the attacks alight, but was able to stay out ahead of those fighting for position on the General Classification. This is an original watercolor and ink postcard that measure 4"x6" and is available through my artist website at www.greigleach.com. For this particular painting, just follow the direct link at the end of this post. 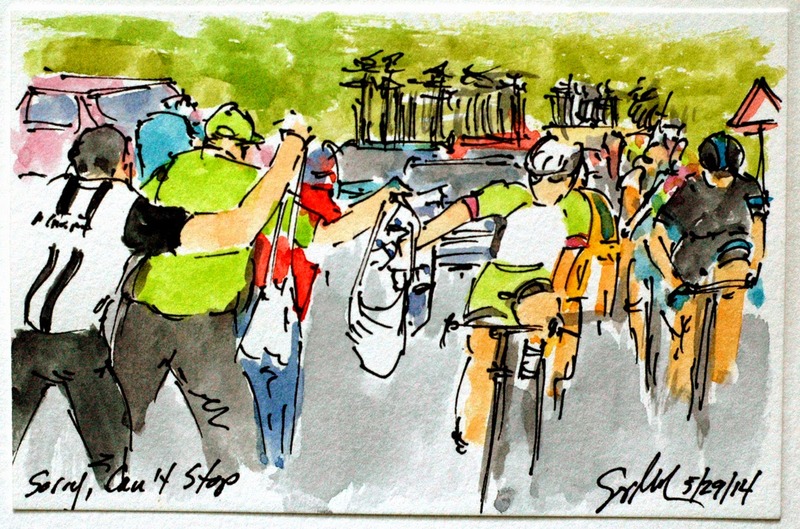 Once the break began to break apart and the selection began in the peloton behind, it was time for the opportunist to take a flyer at the stage win. Johan Davi Arredondo (Trek Factory Racing) went off to defend his lead in the Maglia Azzuro King of the Mountains Jersey, he was joined by Andre Fernando Cardoso (Garmin Sharp) who had been in the early break of the day. The pair are about to pass under the 10 kilometers to go banner under the eyes of the cycling fans lining the whole way up the final climb. This is an original watercolor and ink postcard that is available for purchase through my artist website at www.greigleach.com. The painting measures 4"x6" and sells for $50 USD using my shopping cart feature at the website. For this particular painting just follow the direct link at the end of this post, but don't delay, it is a one of a kind original. 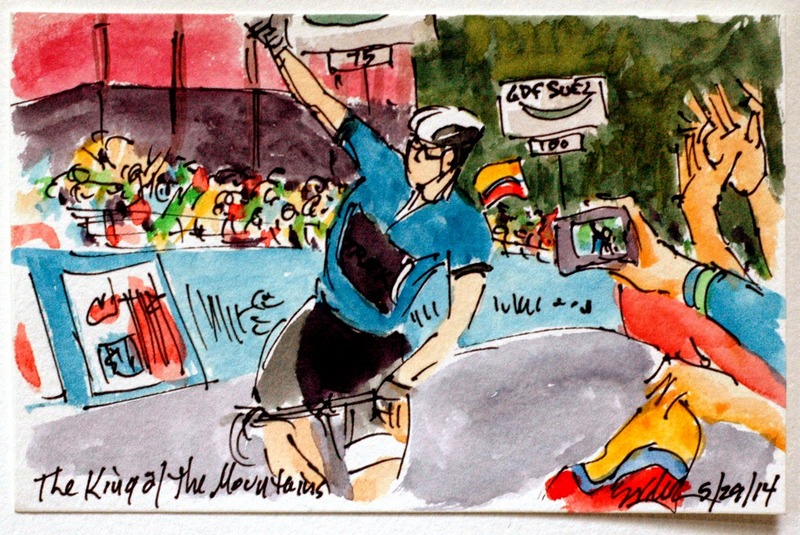 Professional cycling is about the only professional sporting event that is open to the public, free. 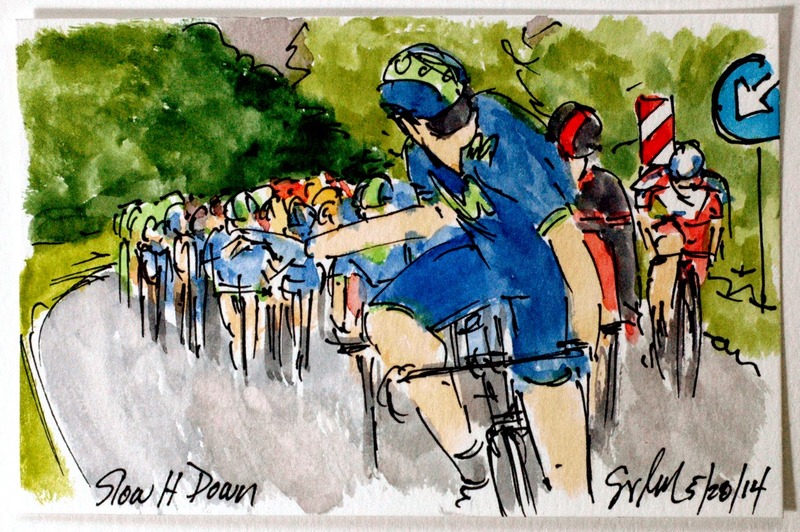 Fans lined the thousands of kilometers along the open roads of Italy cheering on their favorites and the unknowns alike. The Italian flag waving tifosi is cheering on Andre Fernando Cardoso (Garmin Sharp) and Adam Hansen (Lotto-Belisol) neither of home are Italian or even on an Italian team. 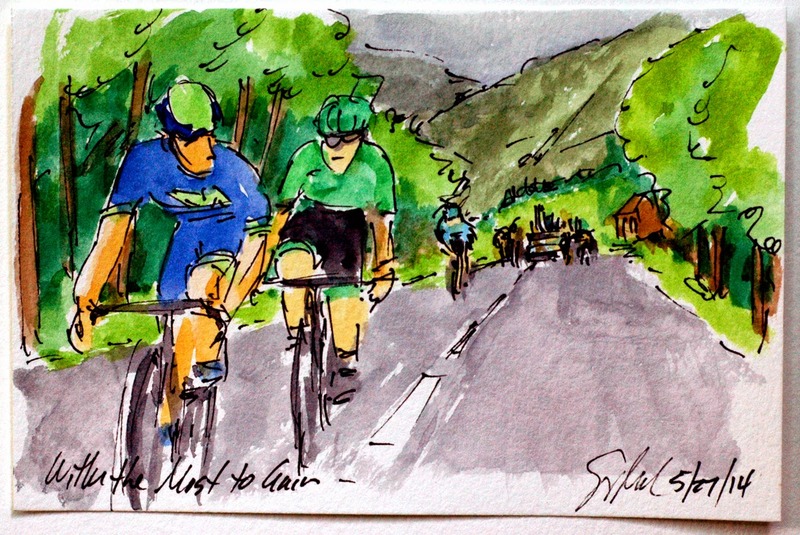 While most are contend to cheer from a safe distance, other feel the need to run along side as the riders use every ounce of strength they have to climb some of the steepest roads in Europe. 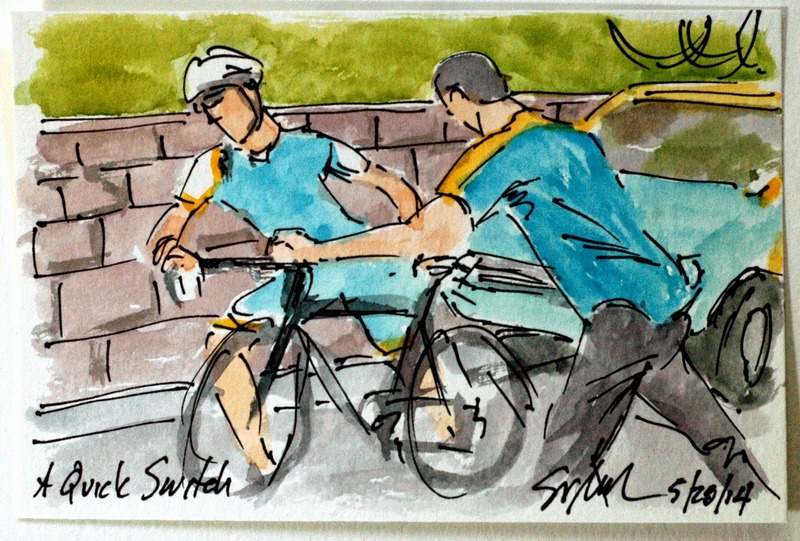 Often they can endangers the cyclists or hamper their efforts to win the race, or survive the climb. This is an original watercolor and ink postcard measuring 4 inches by 6 inches that is available for purchase through my artist website at www.greigleach.com. For this particular painting just follow the direct link at the end of this post. The break away was the first to hit the final (and only) climb and Adam Hansen (Lotto-Belisol) was the first to jump away from his companions and start the assault of the Montecampione. The lower slopes were filled with aggressive moves, but nothing like what was to come from hopefuls and GC contenders alike. This is an original watercolor and ink postcard that is available for purchase through my artist website at www.greigleach.com. For this particular painting, just follow the direct link at the end of this post. The painting is 4"x6" and sells for $50 USD. Stage 15's altimetry was rather amusing, it was intrinsically flat for the first 205 kilometers and then it went straight up for the last 20 kilometers to finish at the summit of Montecampione. The day featured a large break of 10 riders, including Luca Paolini (Katusha). He has just dropped back to his team car to get some food and a little bit of advice on how to get up the beast of a climb that was just down the valley road. This is an original watercolor and ink postcard measuring 4 inches by 6 inches. The painting was created using Yarka St. Petersburg watercolors and Steve Quiller brushes from www.richesonart.com, a wonderful USA company based in Wisconsin. 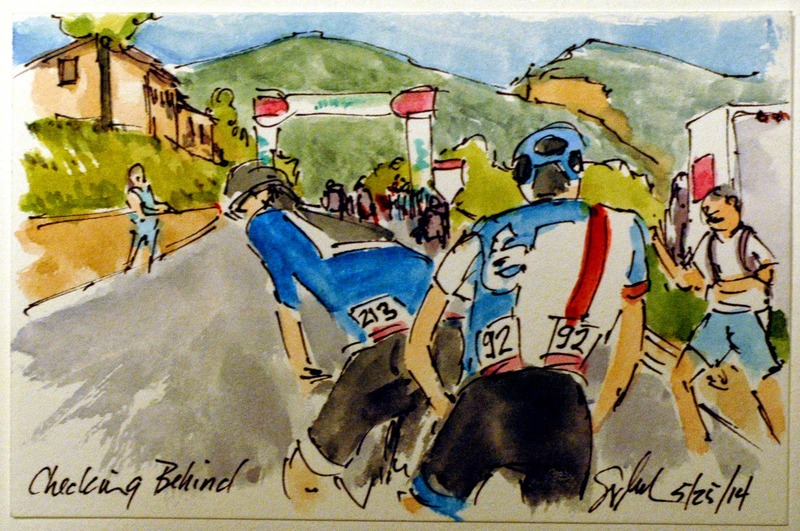 This painting and indeed all of my cycling art, is available for purchase through my artist website at www.greigleach.com. For this particular painting you can follow the direct link at the end of this post, but while you are at the website, why not take some time to browse all of the artwork on offer? While it initially looked like Enrico Battaglin had been distanced by the other two, Dario Cataldo (Team Sky) and Jarlinson Pantano (Team Colombia), he found the strength to make a final surge for the line and to take the second victory in a row for his team, Bardiani CSF. They have now proven that they belong at the Giro d'Italia. It was Pantano that started the sprint, but he faded as they neared the finish, but it was Battaglin that pulled off a long charge slipping by Cataldo just before the finish. He didn't dare raise his arms in victory until he was well across the end point. This is an original watercolor and ink postcard that can be yours by visiting my artist website at www.greigleach.com. For this particular painting you can follow the direct link at the end of this post. Nairo Quintana (Movistar) saw an excellent opportunity when Domenico Pozzovivo (AG2R) went on the attack with less than five kilometers to go to the finish atop Oropa. 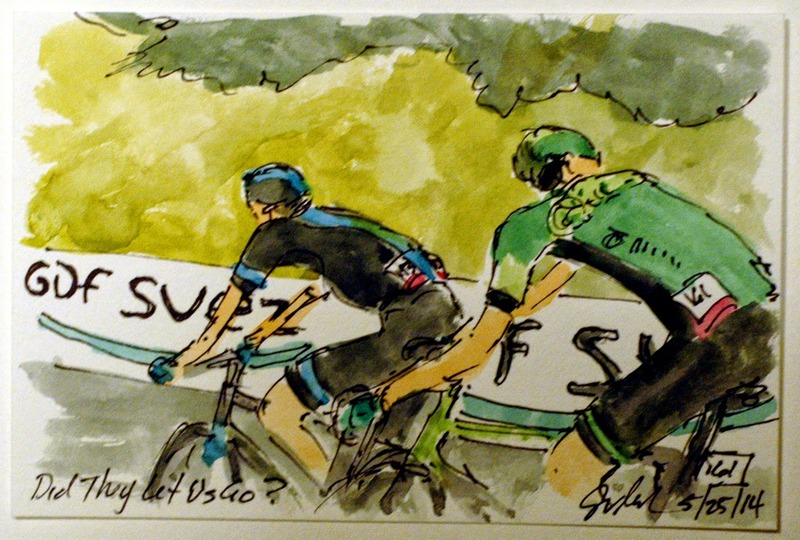 They both sensed that Rigoberto Uran (OPQS) was having a less than perfect day, so they went on the offensive in hopes of gaining time on Uran and their other GC rivals. Quintana has had a rough Giro himself, battling a cold that has impaired his breathing, a serious thing when your skill set is going up big mountains fast. He was on a mission to gain back lost time from the Time Trial, and he and Pozzovivo achieved their main objective, along with the other two main contenders, Cadel Evans (BMC) and Rafal Majka (Tinkoff Saxo). Although the gains were not huge, there are still seven more stages to race, six of them in the mountains. This is an original watercolor and ink painting that is available for purchase through my artist website at www.greigleach.com For this particular painting just follow the direct link at the end of this post. This 4"x6" painting is only $50 USD! The only away to gain time on the Maglia Rosa is to attack on the climbs, that is just what the diminutive Italian, Domenico Pozzovivo (AG2R) did. This group is all of the GC hopefuls, along with Pozzovivo, the wearer of the Maglia Blanco, Rafal Majka (Tinkoff Saxo), the Maglia Rosa - Rigoberto Uran (OPQS), Nairo Quintana (Movistar) and just peeking around Quintana's shoulder, Cadel Evans (BMC). One of the many great things about pro cycling is how close fans can get to their heroes, sometimes too close and they gain that access for free. There are no stadiums, tickets or preferred seating along the roads of Italy. This is an original watercolor and ink postcard (4"x6") that is available through my artist website at www.greigleach.com for only $50 (USD). For this particular painting, just follow the direct link at the end of this post. Nicholas Roche (Tinkoff Saxo) used the penultimate climb of the day to launch his attack on the break away, hoping to use the descent to put time into his rivals. That way he would have a good head start up the climb to Oropa. Roche has hit out a couple of times usually when the road points up. The race has several cars that contain referees that watch the proceedings making sure that the rules are followed and the motorcycles don't interfere with or assist the rider's progress up the mountain. This is an original watercolor and ink postcard that is available for purchase through my artist website at www.greigleach.com. For this particular painting just follow the direct link at the end of this post. 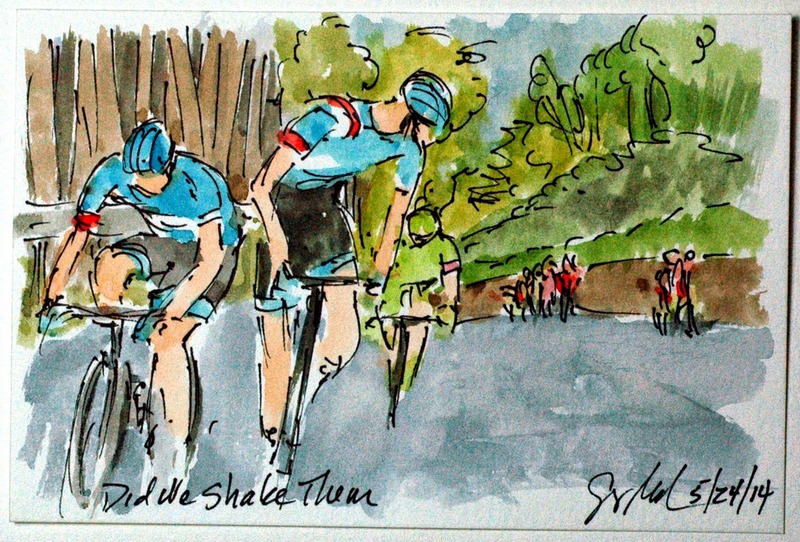 Giro d'Italia Stage 14: Did We Shake Them? Garmin Sharp has had a rough Giro thus far so after Pierre Rolland (Europcar) attacked the peloton, Ryder Hesjedal (Garmin Sharp) and his teammate, Tom-Jette Slagter set out after the two Europcar teammates. 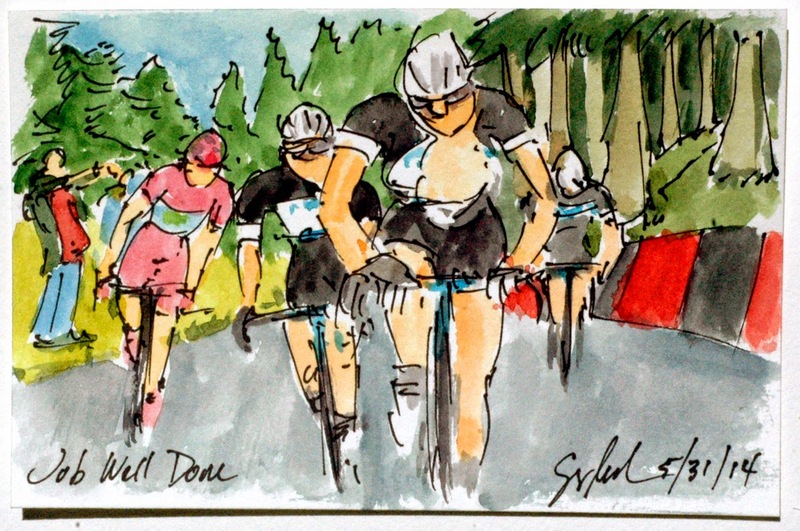 Ryder (one of the better names for a cyclist in the peloton) checked back over his shoulder to see what kind of gap they were getting on the group containing the Maglia Rosa and the other GC favorites. He did spy Matteo Rabatini (Neri Sottoli) bridging up to him. I image he would welcome the additional help in his escape attempt. This is an original watercolor and ink postcard that is available for purchase through my artist website at www.greigleach.com. For this particular painting, just follow the direct link at the end of this post. Stage 14 from Agile to Oropa featured the first big climbs of the Giro, Alpe Noveis was the first Category One climb of the 2014 Giro d'Italia. 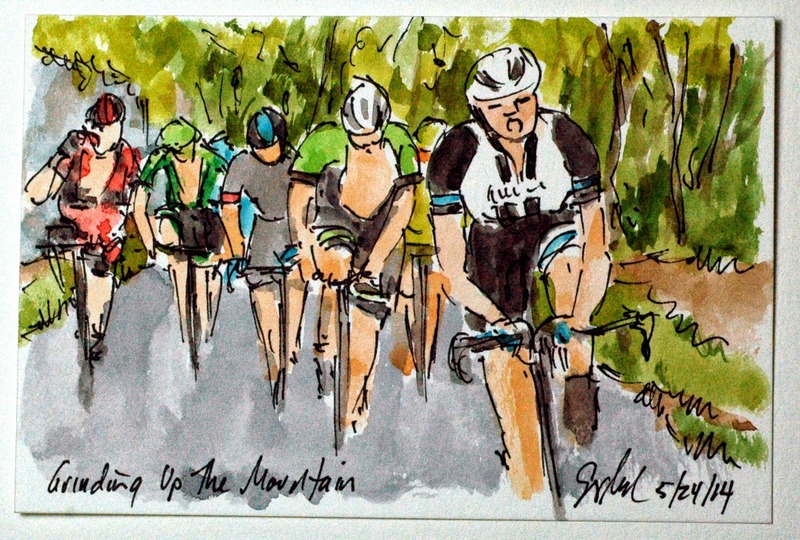 The stage included four climbs on the day, the final summit was the finishing line in Oropa. It should prove to be a big day for the General Classification competition as well as a chance to see the pure climbers in action. 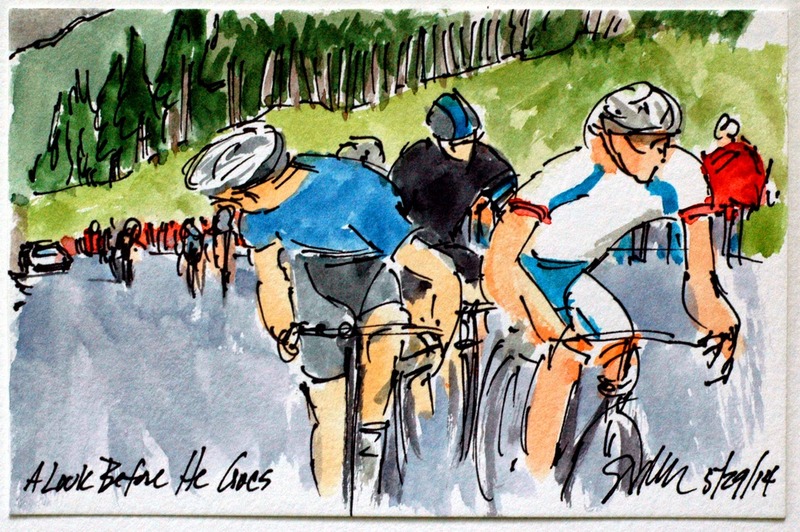 The riders formed a 21 man break over the first climb of the day, but it was the climb up Alpe Noveis that began the sort out that everyone expected to see. The first to push the pace on the climb was Albert Timmer (Giant Shimano) followed by Steven Kruijswijk (Belkin Pro Cycling), Edvald Boasson Hagen (Team Sky) and Manuel Quinziato (BMC), hoping to ride themselves of some of the passengers in the large break away. This is an original watercolor and ink postcard measure 4" by 6" and is available for purchase through my artist website at www.greigleach.com. For this particular painting follow the direct link at the end of this post. Giro d'Italia Stage 13: What's the Gap? Giro d'Italia Stage 8: Where Is He?